Hello again! This week’s Clean and Simple challenge at Splitcoaststampers is to create a Christmas or winter themed card. Since the deadline for sending Christmas cards to Operation Write Home is long past, I decided to make a winter card that can be included in my next shipment. It took me a while to figure out what I wanted to do. I eventually decided on a cute card that one of our heroes overseas can send to his or her child. 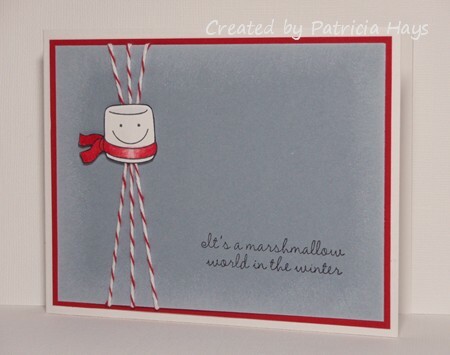 I’ve always thought this marshmallow image was darling, and it was nice to finally figure out a card to use it on. I sponged the edges of the blue-grey panel with white ink, which reminded me of the powdered sugar dusting you sometimes get from a bag of fresh marshmallows. I fussy cut the marshmallow and attached it over the twine with dimensional adhesive. Posted by PH in VA at 11:00 pm Cards, Lizzie Anne Designs, Operation Write Home, SCS CAS Design Team, Splitcoast challenges, Stampin' Up!